Ok so it's no secret I love Mardi Gras.....I mean come on, I'm from New Orleans. I grew up acting like a fool, drinking way too much and showing ta ta's for a pair of plastic beads. Yes, I've done that.....too many times then I'd care to admit. I think if you're from New Orleans you've done it at least once. I mean where else do people get excited over plastic beads and trinkets? Here in New Orleans NOTHING stops us from going to parades. We will go out in the cold, the heat, even the rain and snow if it's time for a parade. Some of us will even go if we're sick. It's just part of who we are. Well, most of you are probably working on New Years Eve cookies.....not me......I'm thinking of Mardi Gras. 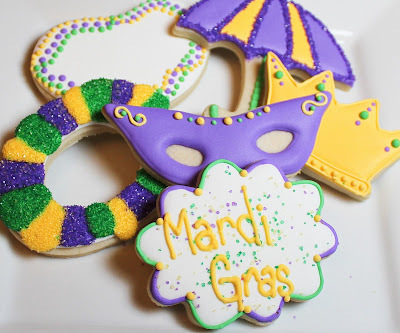 I haven't been decorating cookies very long so this is my first Mardi Gras since I've been cookie-ing and I just couldn't wait to make Mardi Gras cookies. The New Year's cookies will have to come later. I have to get my Mardi Gras fix in. 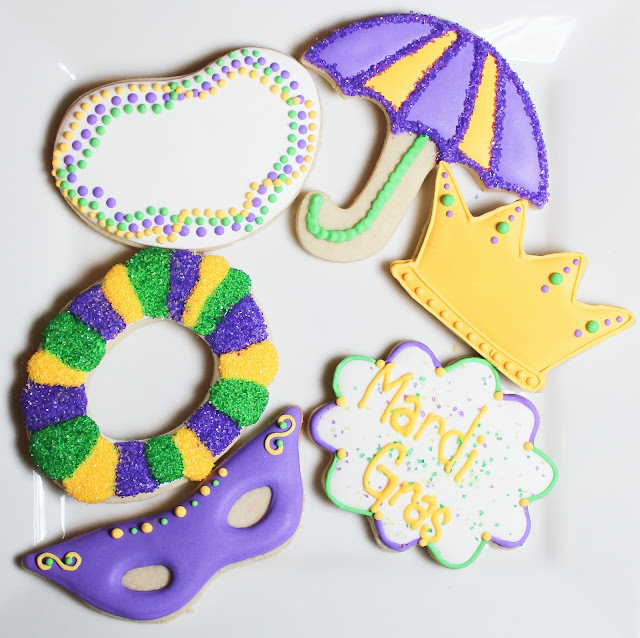 Now that the cookies are done, I must go order a king cake because a king cake cookie just isn't gonna do it. Any of y'all been to Mardi Gras? If not you must come for a visit. It's really something to see. @ Joy, You should visit and see Mardi Gras. There's nothing like it.